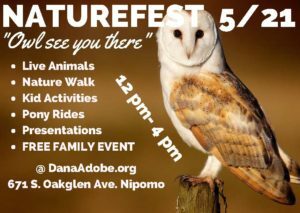 Join us at the DANA Cultural Center for our annual NatureFest. Featured activities include guided nature walks, a scavenger hunt, pony rides, as well as the opportunity to see live animals up close. We will also feature a nature themed art exhibit, informational booths, many hands-on activities, and presentations involving a variety of topics. Admission is free while Heavenly Hot Dogs and Hawaiian Shaved Ice will provide food for purchase. Don’t miss this chance to create fond new memories and explore the wonders of nature at the Dana Adobe!